The latest addition to the TSP654 series is the 2nd Generation TSP654ii. However due to market demand on lower pricing, STAR Mironic then launched the TSP100 series – TSP143. TSP143 have been upgraded to the 3rd generation TSP143iii as of time of writing. You already know that TSP143 is their flagship model of lower price for value. 1. Adapter: TSP143 comes with an internal adapter, whereas TSP654 has an external adapter. 2. Modular connector: You can remove cables from connection port onTSP654, whereas on TSP143 you need to replace the whole printer. 3. Print speed: TSP654 – 300mm per second; TSP143 – 125mm per second. For TSP143, STAR designed the adapter to be built within the printer. It might seem like a space-saving feature but realistically speaking, TSP654 with its external adapter is way better. For instance, if your TSP654 adapter broke down, you can just replace the cable and resume your orders. However, if you own a TSP143 and its internal adapter became faulty, you’d have to send the whole printer back to STAR for service. TSP654 comes with ports that are removable. On the contrary, TSP143 ports are fixed and you cannot switch them freely. If one day you didn’t want to use the USB port anymore, and you wish to change your traditional POS system into the iPad POS system (iCHEF, for example), you can just unplug the USB port and switch it to LAN port and resume usage. The same case would be more complicated with TSP143, as you’d need to replace the whole printer. 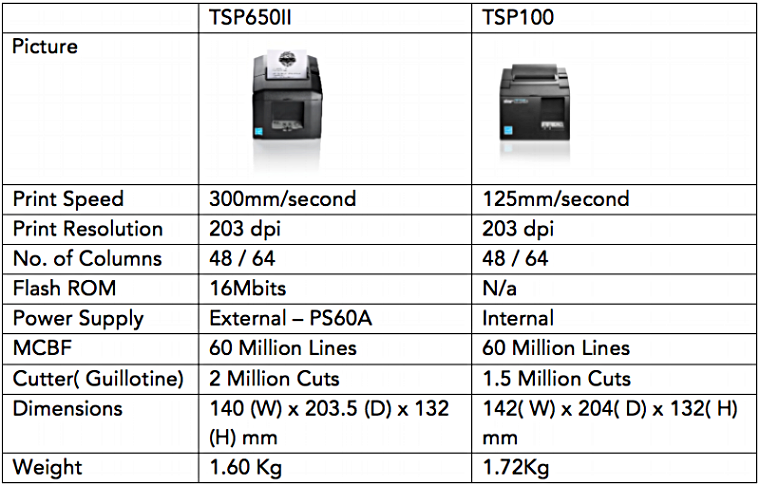 Does the printing speed of your thermal printer matters? Of course it does! You wouldn’t want your customers to wait for your printer to finish doing its job do you? TSP654 is easily the winner here with a print speed of 300mm per second as compared to TSP143 that is merely 125mm per second. The above specs and info are from STAR’s official website. Right now iCHEF POS System supports both TSP654ii and TSP143 Thermal Printer. However, we highly recommend you to choose TSP654ii over TSP143 for its value outweighs its price. The price difference between TSP654ii and TSP143 is not overwhelming, so why not get the TSP654ii? or leave an enquiry on our website.